Hair extensions are a most popular beauty fashion tool for women today. You can easily create a natural look by adding additional hair extension that matches your own hair. I think hair is one of the most important accessories a woman's outfit .If you are bored of the current haircut you can always change yourself and the next day to appear as if you were another person. If you want to keep your extensions looking fresh and ready to install for the perfect hairstyle at any time you want,you can choose some cheap human hair extensions,they are convenient and useful.And have different hairstyles for your choice. 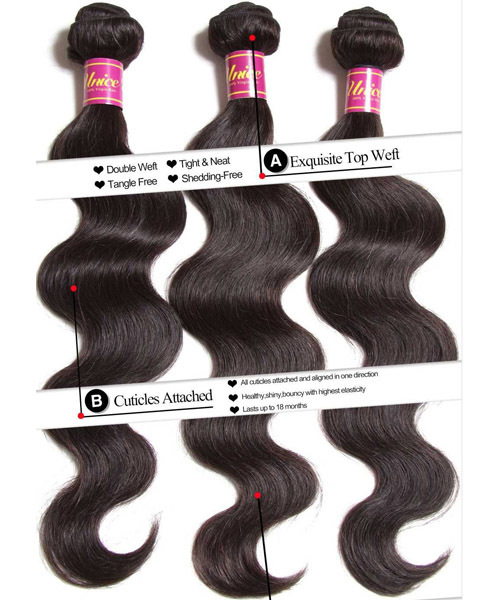 To be honest, Virgin human hair is the top choice for women.It’s the most popular for it has a fairly low price and with good quality.Besides,It's just like your hair like natural that no one can find the hair on your head not yours.You can do whatever you want and it doesn’t need care and maintain at all. They can be dyed always.The hair Extensions are premium quality human hair, very clean, natural , soft, comb easily,there are no synthetic, no animal hair, we choose high quality hair which was cut off from young ladies directly, there is no chemical treatment.They can be easily Straightened, Curled, Dyed, Bleached and Styled by your favour! Summer is coming, you can try this hairstyle.↑↑↑ Beautiful long curly malaysian weave UNice hair extensions hot recommend ,match with your skirts. Come on,This summer,change yourself start from your head.Choose your favorite haircut you want with coupon code to save $$ money!We are waiting for you!